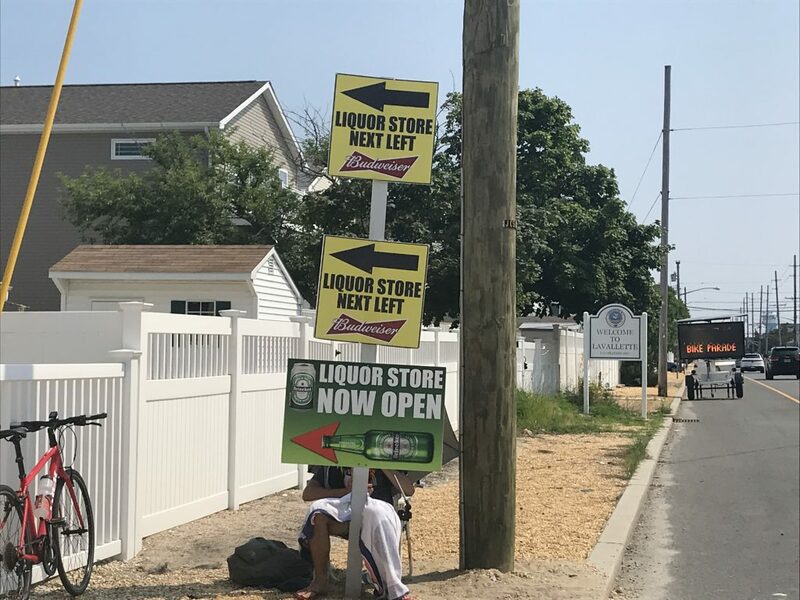 Just as bridges, water towers and miniature golf courses dot the route to “the Shore” for many tourists, so does another familiar sight: a man (sometimes in a beach chair) waving a sign directing the masses down the proper street to purchase some libations for the trip. Lavallette officials say they would rather go without the roadside spectacle, but the owner of Lavallette Liquors said the small sign on Route 35 south is vital to keeping his business afloat. The matter became a subject for public debate this week at Lavallette’s borough council meeting. As it turns out, the issue of the “sign guy” goes deeper than anyone had ever thought, with both Lavallette and Toms River Township police both involved in shoeing him away – at least over the border on the other side of the street. The man is employed by Lavallette Liquors, located on Route 35 north. The liquor store sits on the border of Lavallette and Toms River, and both towns have received complaints, said Mayor Walter LaCicero. But when officers from one town ask the sign-bearer to move, he usually just crosses the street from one jurisdiction to the other. The liquor store’s location on the northbound side of Route 35 is the reason the sign exists. Joe Loundy, its owner, said he depends on tourism revenue to keep the business profitable. If visitors from North Jersey or New York don’t know where to turn to stock up on spirits on their way into town, chances are they’ll go somewhere else, he said. The controversy over the sign goes far beyond small-town politics and preferences. Borough Attorney Philip George said there may be first amendment concerns regarding “commercial speech” if the borough tries to oust the human billboard for good. Robert Brice, Lavallette’s administrator, is a former police chief in Wall Township. There were similar complaints there without a clear solution. Vicki Centanni’s home backs up to the state highway right-of-way where the sign is usually displayed. She said she’s spoken with the sign holder – “he seems like a nice guy,” she said – and has witnessed the cat-and-mouse enforcement firsthand. At one point, she said, an officer told the man he had to continuously move while holding the sign. Others have ordered him out of their jurisdictions. “They always come back with a new directive – you have to sit here rather than there – and then the police come again,” she said. Loundy said employing someone for the sole purpose of holding a sign “costs a fortune,” but is necessary to compete with chain liquor stores like Spirits or Buy Rite. There were several ideas thrown around at the council meeting about how to get around the constitutional concerns. One resident suggested taking the matter up with the state Department of Transportation since, in theory, the sign could distract a driver and cause them to turn too quickly. “There may be a restriction from the state because he’s standing on state property,” said Council President Anita Zalom. George said the borough may look into placing a restriction on the business’s liquor license ordering “compliance with all borough ordinances,” including the code for advertising signs. LaCicero, himself a former police officer who now works as an attorney, asked George to do some research on the matter. “There’s a lot of constitutional law with regard to somebody holding a sign, no matter where he is,” LaCicero said.